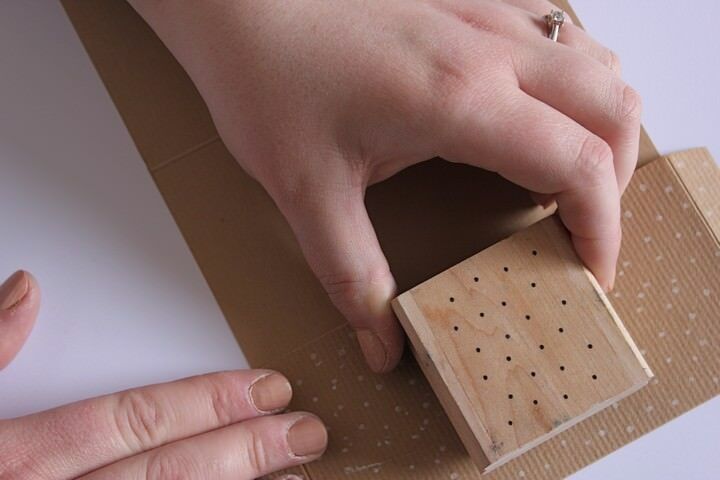 Today’s DIY Tutorial comes from one of our very own Boho Brides, Becki. As you know Becki is having a very DIY wedding and she has been busy getting her big day planned and getting her craft on. 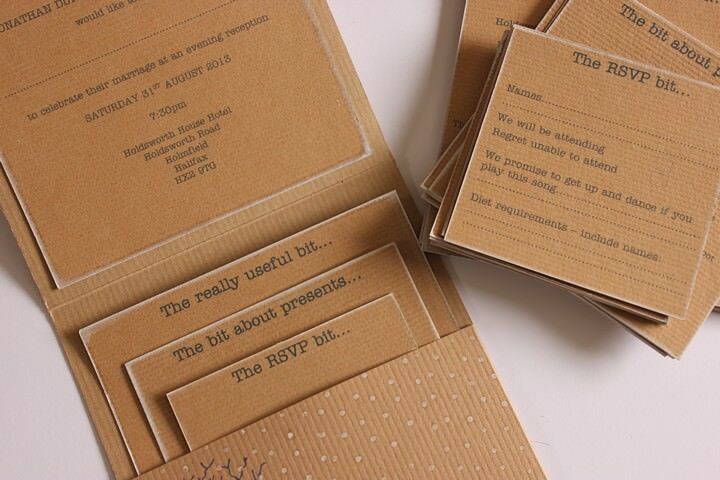 As well as this Becky has started her own stationery business Love Knot Creations. And today it is her stationery that we are taking a look at as she shows us how to make these rather lovely Kraft Pocketfold Invitations. I think these look amazing! and even though they look really difficult to make they are actually really quite simple! 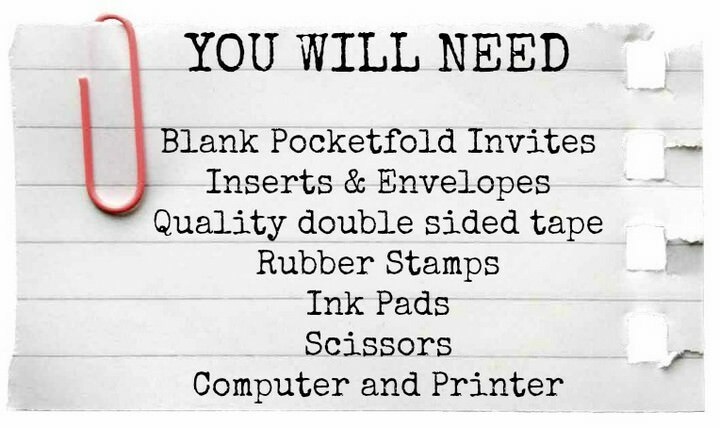 To get started you need to buy your pocketfolds and envelopes. 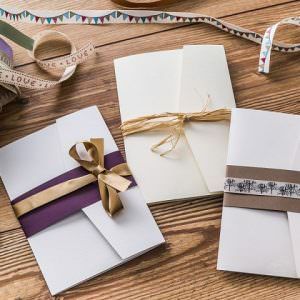 When I set out to make them from brown kraft card that looks like traditional brown wrapping paper, I struggled at first to get the envelopes to match so if you want to create the same thing here’s where I bought them from. You can use any stamp you desire for this so it really is all about your theme for your day, but I bought the large heart stamp from a seller called Noolibird on Not On The Highstreet. The two stamps which read “All you need is love” and “LOVE is all you need” were from the very talented Nicky at Stamping All Day. She has a huge range of stamps readymade, but will also custom make them for you too if you send her the text or an image. The quality is unbelievable and I’ve been able to really customise quite a lot of things for our wedding by using this method. Have your pocketfolds, stamps & ink pads ready aswell as a slightly damp cloth to avoid any ink getting onto your perpex block and you are all set to get creative! 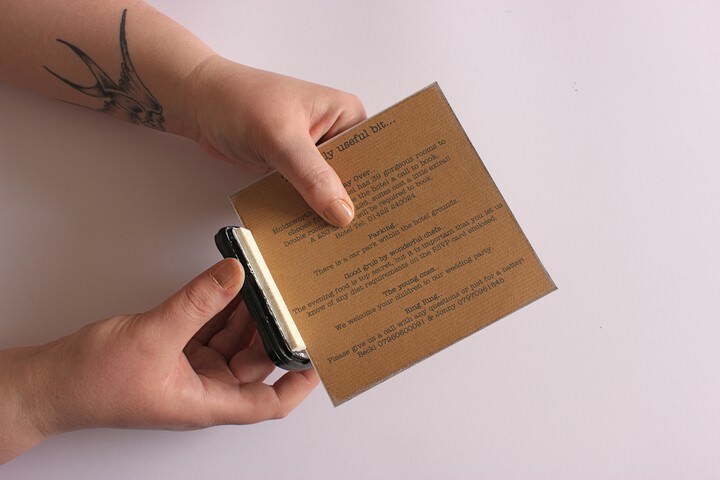 Step 1) These particular pocketfolds have a texture to them, of a ribbed nature so you need something soft underneath them when pressing your inkpad onto the card so that it stamps fully on the textured surface. So I set myself up with a mouse mat turned upside down so the spongey side is on top and used this to stamp on. There is probably a technical way of achieving this but it worked for me! 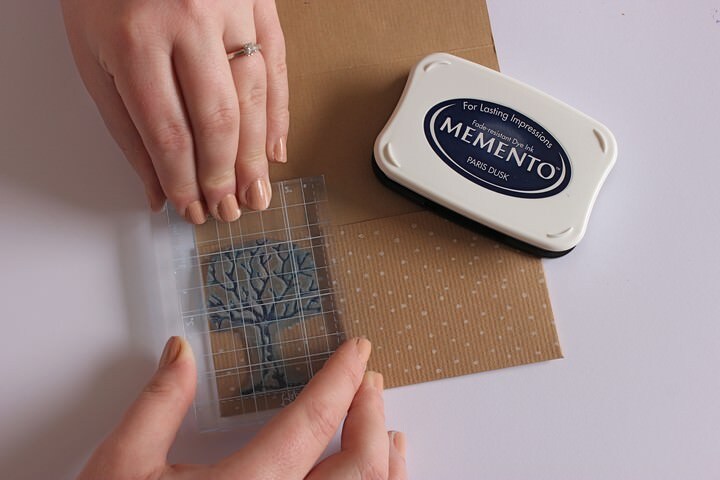 Step 2) Load your stamp with the ink and press it down onto your pocketfold. Leave it to dry before attempting to stamp in the same area otherwise it may smudge easily depending on the type of ink you use. I used Tsukineko Momento ink pads as they are better for finer printing, but the effect depends also on how porous the card is that you are stamping onto. Step 3) When you have stamped your pocketfolds you are ready to start the inserts. I bought the inserts already cut to their specific sizes so that they staggered down in front of eachother and then I set up a word document for printing them. To get the word document all aligned and correct depends on your own printer so I’d recommend getting rid of your margins on your page and setting it up as a textbox to the same size as your insert. Then printing it out on plain paper cut to size so you can see exactly where your words are gonna land on the card. Step 4) Once I had my inserts I decided to make them have a white border edge to contrast a bit. I did this simply by taking a white ink pad and dabbing around the edge of each one. The spongey texture of the ink pad coats the edge but also gives it a bit of a softer border aswell. Step 5) Whilst they dry, take you’re pocketfold again and you now need to stick down the bottom flap which creates the pocket. 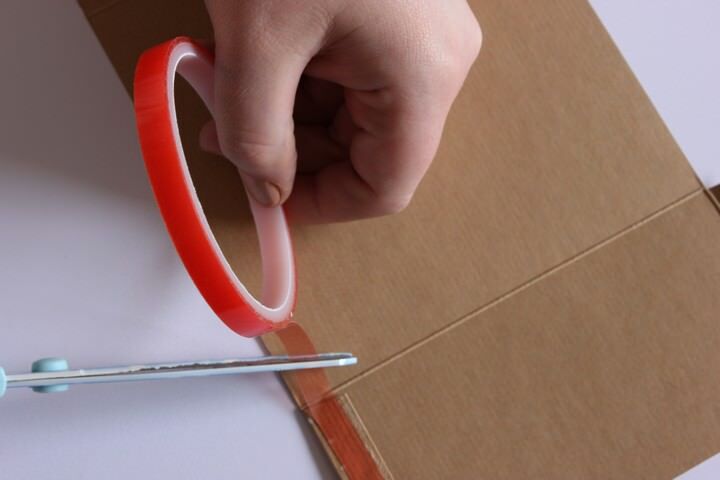 Just 2 strips of double sided tape does the trick but it need to be the high quality tape otherwise they will pop open at any time. Step 6) Next you need to stick the main invitation insert onto the inside of top part of the pocketfold by using 4 strips of the double sided tape around the outer edge of the card. 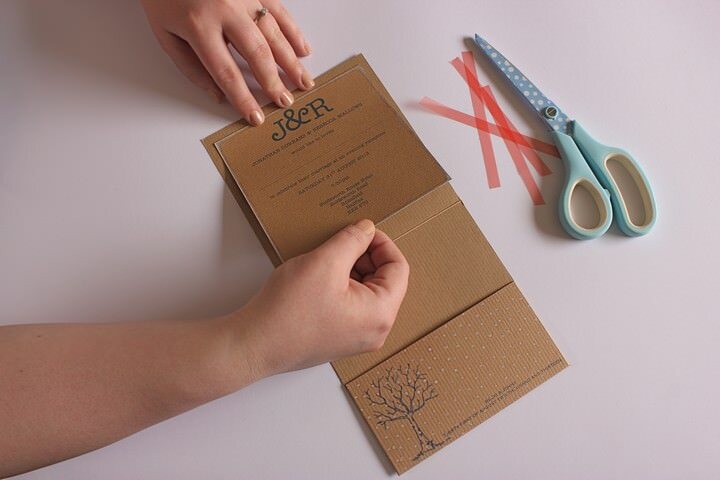 Step 7) Pop the rest of your inserts into the pocket along with your RSVP envelope and you are done! 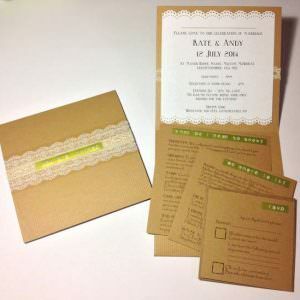 Gorgeous invitations and fab tutorial, Becky, and thank you for the mention! Can I ask where you got the pre cut inserts from? I can’t seem to find the sizes on the web site for the inserts? Hi, I don’t usually comment on blogs but I just had to for this post. I just want to thank Becki for this as its perfect for what I want. I’ve just ordered the pocketfolds, inserts and stamps and hope mine turn out as well. 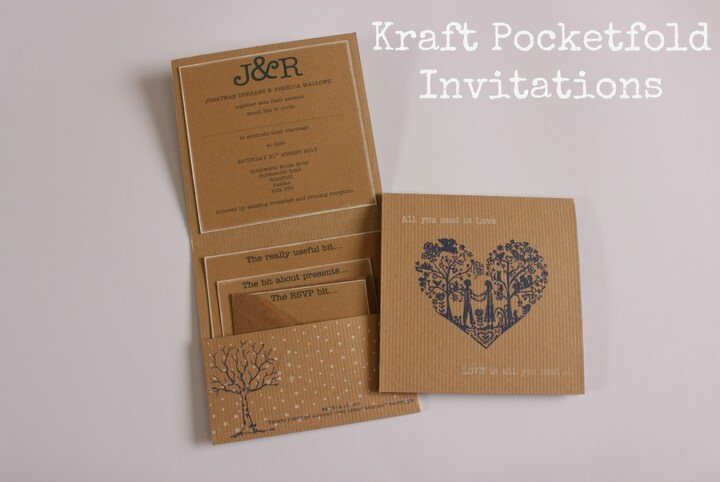 Hi Becki – love these invites, I have been looking everywhere for places I can buy pocketfold invites and inserts. Its so refreshing to see a brilliant UK DIY tutorial. Can I ask are the outer envelopes, from Craft Creations, the KRE04, 152mmx152mm ones? And are the envelopes for the RSVP inserts, from Ideal-Envelopes, the Ribbed Craft 100mm Square envelopes, code: 100RKRAF ? Viv yes the outer envelopes are the 152mm ones and smaller ones from Ideal Envelopes are the Ribbed Craft ones and pretty much match the ones from Craft Creations. Gorgeous invites! Have bought all the materials except a white ink pad. Can’t seem to see a white Memento ink?? Where did you get yours from? Thank you Karen, the stamp is this one. I didnt purchase it from here though it was through a seller on ebay so if you try ebay aswell. The white ink is made by “Ink It Up” that is the best one i’ve found. Dont use the Dovecraft one in white as it sinks into the card too much and leave a sort of outline of white instead of a crisp stamp. 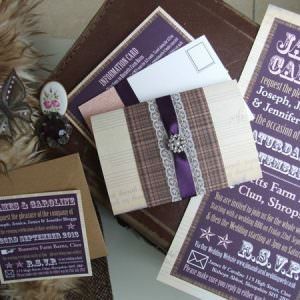 Your invitations are stunning… I am in the process of making mine and would like to steal some of your stamp ideas if poss! Where did you find the polka dot and tree stamps? Karen, no problem hun, it’s the blue inkpad shown in the photo made by Momento and in shade Paris Dusk. Best one for getting the tiny details on the stamp which is what the ink is designed for. Laura, thank you very much, glad you like them. The dotty stamp i bought ages ago so no idea what the make of it is but there is a similar one being sold on ebay now which is made by Inkadinkado – classed as a ‘background stamp’ so that is very similar to mine. I love these invites and would like to do something similar. Where did you get the clear backed stamps? I looked at your Noolibird link but they are only shown with wooden backs, which I’m assuming will be really difficult to get the stamps in the right place. Amazing invites and great step by step tutorial. Really does save you money and is easy for those of us out there that arent as creative as we would like!!! can you tell me how you get the printer to print onto the inserts. 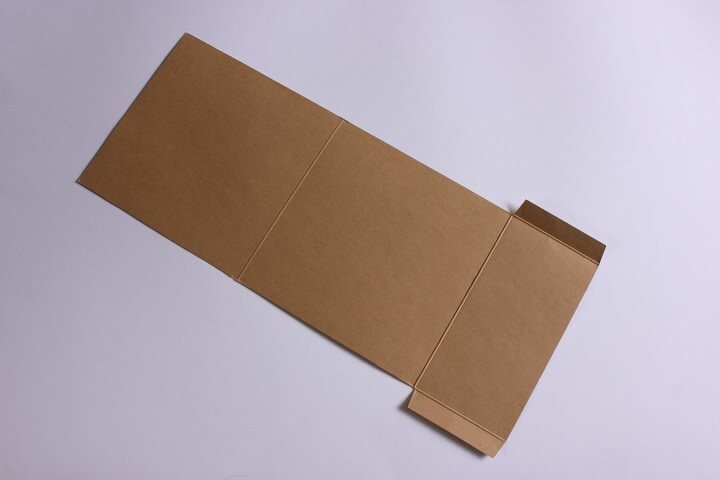 i’ve tried making boxes the size of the inserts but when it comes to printing it ends up covering the whole of the page? My fiancee and I are in the process of creating these great invites, we just wondered if you remember what font you used on the inserts? 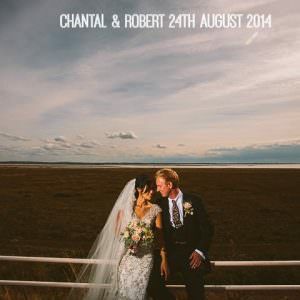 Hi Craig, Great stuff, love it when a groom gets his hands dirty in the wedding planning! The font I used was American Typewriter. If it’s not already included in our version of word you can download free fonts from places like da font that will be similar. I LOVE these and cant wait to make them. I just want to check is it the 148mm pocket wallet that you got and the insert that is stuck on to it (the main invitation) is this the 148mm square insert?? Love your tutorial and have been adapting it for my own invites. Can I ask what printer you used to print the card inserts? My printer just chews up the card and gets all confused (I have the Word doc all properly set out)! It can’t seem to cope with the thickness of the card. I even contacted a professional printing company to ask them to print them for me and they said their machines couldn’t print on pre-cut card. Arghh! Starting to panic!!!!! Help! Love your work, have been asked to make these for my friends wedding. 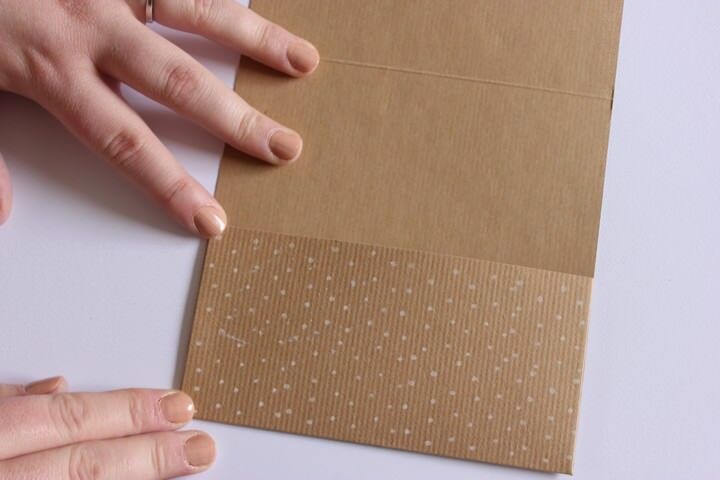 can you tell me where to get the small rsvp envelope for the pocketfold insert as the site ideal envelopes that you recommended does not do them anymore. So where else can I go? I think these are the right ones if anyone else is looking for them. Are the inserts 135mm/135mm, 135mm/115mm, 135mm/95mm? And I’m guessing the 135mm/135mm you need double of as you have them on reverse sides? Sorry for all the questions but I wanted to check before I ordered them or if anyone else has already ordered them are they correct? 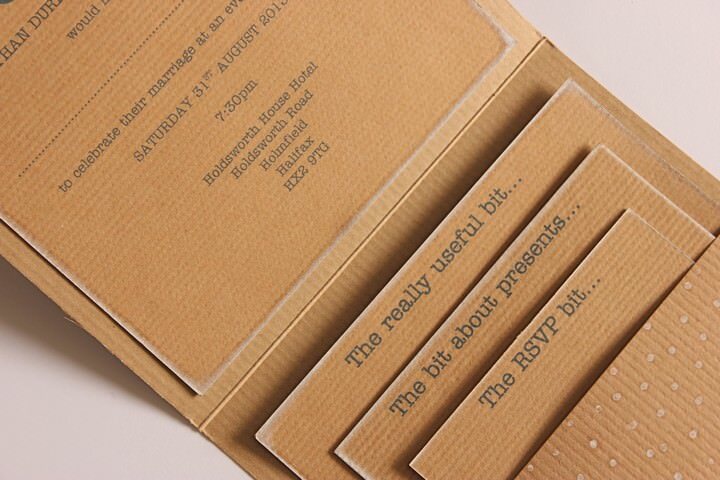 These invitations are just brilliant. I’m trying to recreate them and have bought the ‘Ink it up!’ white ink pad to do the edging around the sides of the information sheets and the ink is taking forever to dry. Is there some way I can get it to dry or is there another type of ink I could use? Thanks for your help… Any advice would be much appreciated! I cant wait to start making these. Can I ask what you put in you invitation? I’m not sure where to start with the information that needs to go in. 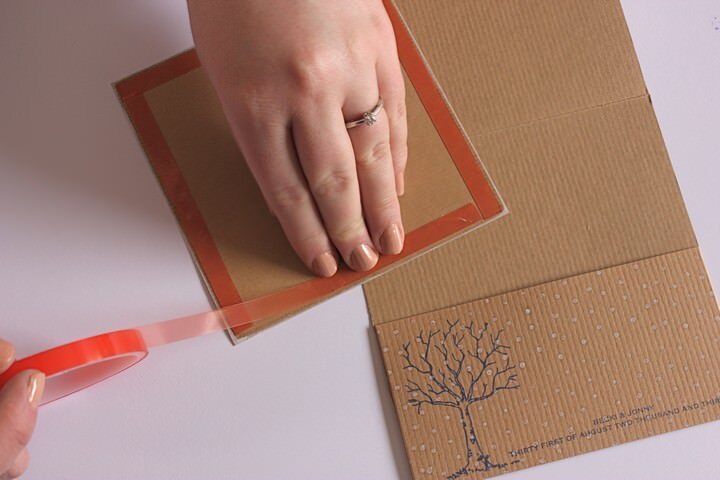 Ok I had this issue to start off with but before you do anything have you tried stamping on a piece of plain paper? If that doesn’t stamp all the detail then it could be a faulty stamp which you can send back. If it does stamp then this is the alternative route but once you’ve done it, you can’t send it back!! I decided to take off the rubber stamp from its wooden block, remove all it’s backing and then mount it to a Perspex stamping block. It’s a bit tricky then making sure it’s flat so I put thick double sided tape under areas where it didn’t stamp as well to raise that part up. The only other thing I can suggest is, make sure you apply pressure all over the stamp, stand up whilst you do it and use the palm of your hand over all of the block. The ink you use can also have a big impact too. 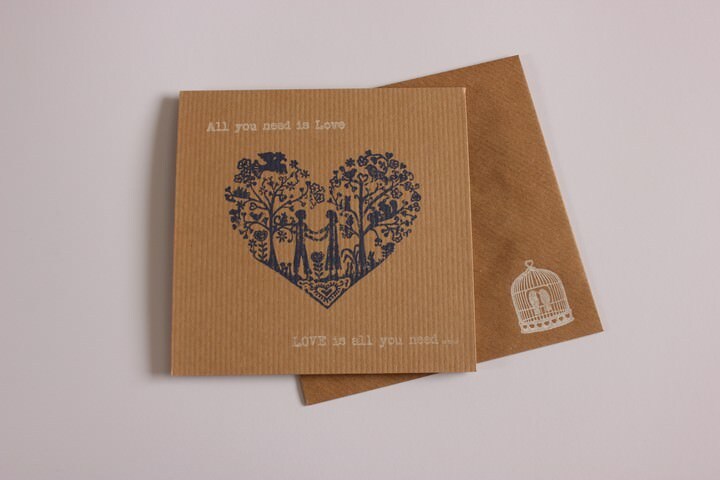 Hi Becki, I’m just about to order the card and inserts are the sizes I’ve asked about in my earlier question correct? Also did the size of the card still fit as a normal postage stamp cost once you had put them together? Sorry totally missed your comment, no the sizes of the inserts are square so it’s 95mm x 95mm, 115mm x 115mm and 135mm x 135mm. They sit in front of eachother in a staggered way so you can see the outer edge all the way round. Yes as long as you don’t put anything else in the invite that bulks it out too much then just a first or second class stamp is fine. How did you get your printer to print on the card? is it a special printer? do you have any templates? These are amazing! 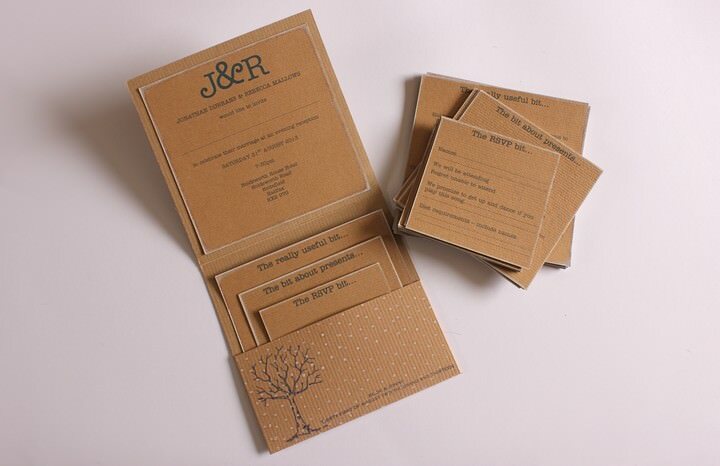 Please could you send me the link to the correct pocketfold cards? I can’t find them. These are amazing and would love to try them for our wedding!! Could I also ask do you have another link for pocket fold as the link provided has an issue. Thanks!!!! Can you tell what colour ink you have used for the heart and text? I am going to use the same colour card but Im not sure if you have used black, brown or dark blue ink? I used just a normal canon printer for it. It’s this one. You need to set up the word document to the correct size of insert. ie. change the page size from A4 to the custom setting and type in the correct measurement. My printer has a top loading paper feed and a slider to adjust to hold the paper/card in. It should go through even on the smaller size ones. I even printed on luggage tags which are thinner than the inserts. No I didn’t have any problems as long as you just print each insert one by one, ie, don’t have all the blank inserts stacked in the paper tray, just feed one in one by one. If you can’t print them, you could as a last resort get a personalised stamp from stampingallday.co.uk she does custom stamps so you would just need to send her the word document and size you need it to be. 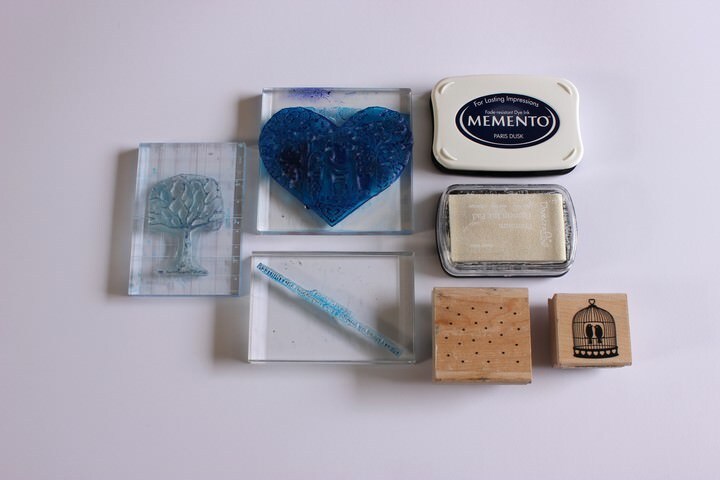 You’ll also need a clear Perspex stamping block to mount your stamp to. Wow!I absolutely love these and am going to make them! Which size heart stamp did you use from noolibird? The heart stamp I used for the front was the larger one and you could also use the smaller one on the inside instead of where I used a tree stamp. Pretty sure it would fit. Thank you so much Becki – such lovely invites! Do you know where I can buy the card inserts? I only seem to be able to find the 135×135 on Razzle Dazzle. I have all the materials apart from the heart stamp as when I measured the stamp against the 148mm square pocketfold it seems the large will be too big? Is it the 13.5 x 14 stamp on a 148mm square as it just seems like it will be too big? No it’s the medium sized one sorry! It was the largest size available when I was doing mine, but now there’s three different sizes so it’s definitely the “medium” one at approx 9cm x 9cm so it should give you plenty room around the edges. I love these invites so much! 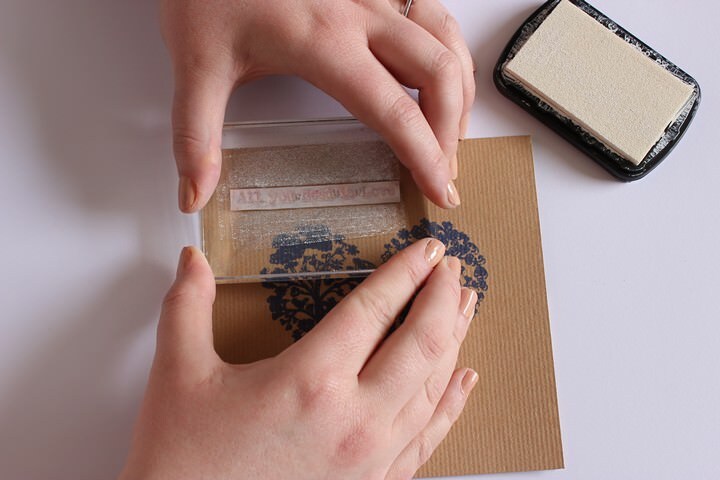 The tree stamp was just an image I found if you search for fingerprint tree free printable in Google that you can save and then it was The English Stamp company who made it into a stamp for me. OR you can get different sizes of the Noolibird heart stamps now and the smallest one will fit on the inside where the tree is. They will be different types of ink hun, pigment inks are slow drying and sit on top of the card rather than sinking in to it like dye inks. Which might explain why its not looking as good as the momento ink. Have a look at what you’ve got at the moment and try swap it to the other type of ink. I think it was Dovecraft ones I used but I can’t fully remember cos I ended up in the same situation with buying more and more till one worked! mi fiancee and I are also in the middle of creating our invitations and we just found yours! they are beautiful! I was just wondering: why did you use two different brands of ink? aren’t they the same quality? which one would you recommend? I want to put a white lace-stamp on our invitations. should i buy memento or ink it up? thanks for everything in advance! I can’t seem to find the smaller Kraft inserts on the website you recommended any more and I’m having trouble hunting them down. Am I looking in the wrong place? Or please can you recommend another supplier? The inserts – this is a bit more tricky as when I ordered mine they did square cuts to fit which were 135mm, 115mm & 95mm squares. They don’t seem to cut them in squares now so I’ve given you the link to the ones they do and you might have to cut them down to size yourself or email them to ask if they will do them for you? Sorry I can’t remember the exact one I used as I ended up trying loads out to get it to work but I think from looking back at my comments to people above, that it was the Momento Ink Pads and Ink It Up ones that worked. There is also Stazon ink that might be another option as that is supposed to stamp on any surface. You could use a darker ink? Or you could print the wording in navy blue onto the Kraft card strips, mount it on navy blue card to give it an edge border and use double sided tape to apply it to the front of the invite. Or the same technique but onto cream card and mounted with the Kraft card. Stamp ink onto ribbon? You can buy fabric ink for this. You can also use pigment ink with embossing powder which you pour over the ink when wet and then use a embossing tool, which is a small blown air tool which heats up the powder and seals it so it’s shiny and stands out from the card. You can get different coloured powders. Stamp onto luggage tags instead, different card may deal with the inks you already have better. Hi all, I’m very late to the party on these invitations although have had them saved in my wedding file for nearly two years!! The time has come to make these lovely invites! I have everything and have read through every comment and answered all my questions except one. When I made these I just decided on the size of the tree by measuring the pocket flap top to bottom. Take off between 0.5 cm and 1cm depending on the space you would like to see above and below it and then send that to the stamp making company. They will adjust the image to fit that height so you don’t need to worry about the width. Hi Becki, what wording do you have on the pocket fold beside the tree? Is this just a custom made stamp? Purchased all my card and now ordering my stamps. Thanks to share this useful blog. Last month, I can also make invitation on my son’s birthday and I can decorate with glitters. Its envelope is very attractive. Next year, I will definitely make pocket fold invitation on my son’s birthday. I’m wanting to do this all from scratch but I’m really bad with measurements. What are the measurements of the main bit of card? And each individual insert? Thank you for creating the most perfect wedding invitation! !